What follows is an update on the IWW campaign at Ellen’s Stardust Diner, where wobblies have waged on ongoing campaign. To hear our podcast interview with someone from the campaign, go here. 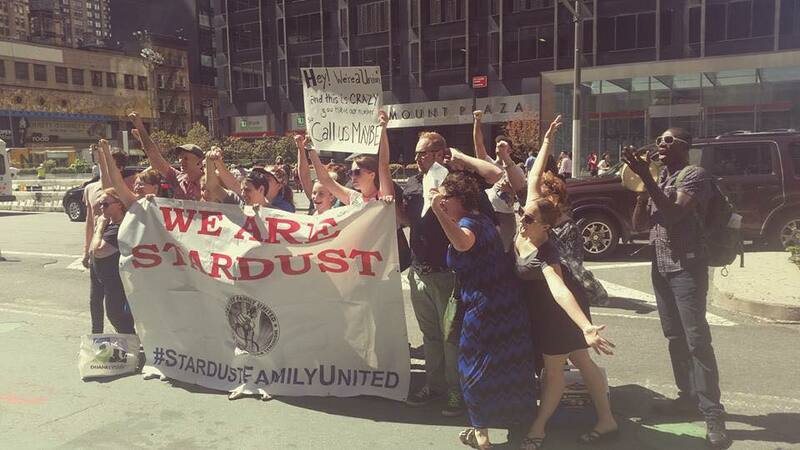 Stardust Family United was formed in 2016, in an effort to fight for the underserved employees of Ellen’s Stardust Diner in their struggle against the unfair, unsafe, and unlawful labor practices of their employer. Blatant disregard for the workers’ well-being ranged from ignoring pleas to fix dangerous equipment in the shop, resulting in multiple injuries on the job, to bullying tactics designed to shut down communication between employees. Undeterred, the members of SFU waged a struggle in the shop, in the streets, and in the courtroom. By refusing unsafe or unpaid work, the singing servers have dramatically improved conditions on the job. Through protests, pickets, and walkouts, they placed pressure on the boss to re-hire the illegally terminated workers. And despite Sturm’s repeated attempts to break their spirit with shameful tactics, from hateful “anonymous” text messages to false allegations in a NY Post article, SFU has stood their ground every single time. And every single time, they’ve won.